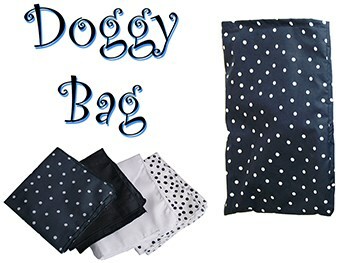 EFFECT: The performer displays a black cloth bag with white polka dots on the outside along with plain white and black handkerchiefs. Placing the silks inside the bag, he explains to the audience that he'll make them switch places, turning the black hank white and white hank black. After saying the magic words and removing the magically switched handkerchiefs the audience is understandably unimpressed. Offering to try something even better the magician then announces that he'll place the silks back inside and this time make spots appear on them. However, after removing the same old hankies from the bag there are more complaints from the audience (apparently they didn't believe that you put white spots on the white handkerchief and black spots on the black one!) The magician offers to try things one last time and places the silks back inside and...this time it works! You pull out a white hank covered with black spots and the black hank has white spots all over it! "But wait, there's one more spot left in the bag!" 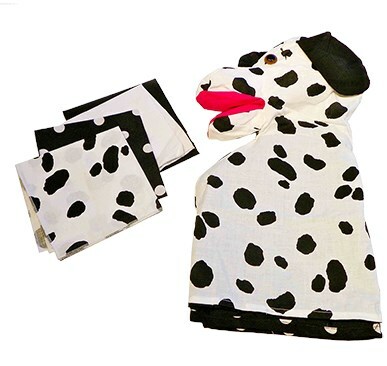 the performer explains, and turns the bag inside out transforming it into a Dalmation hand puppet!